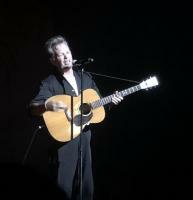 Wow ... so nice that fellow Hoosier Mr. Mellencamp is still pouring out the tunes for us. While I can remember listening to him a bit in high school (1979 ... I need a lover) ... I must admit I did not embrace him or his music. Frankly, as a young man, trying to find his place, I would not consider taking a date to his concerts ... how could I be the one in "her" eyes ... after one of his concerts??? Yeah, I know that sounds sad ... but very true. Even in college, Mr. Mellencamp visited Purdue (Hurt's so good, Jack & Diane, Lonely Ol Nights) ... my friends went to the concert. I passed ... I think that I still was so immature that I just could not face such "in your face" manliness. Looking back, we was ... and still is a very good role model ... that I would have done well to emulate. Years later, after I was working, married, and felt that I had proved myself a bit ... to myself if no one else ... a friend said what a fan of Mr. Mellencamp she was. So I revisited his music ... and have really enjoyed it ever since. He is an American rocker that truly shares his gifts generously with us. When he visited Jimmy Kimmel Live with his granddaughter in tow ... and the audience sang along ... nice stuff. Now listening to "Troubled Man" ... he cuts deep into just about every man's psyche ... better than anyone that comes to mind. So proud of my Indiana roots and the way he shares them with the rest of the world. Also been a fan forever, John's musical artistry is awe inspiring! He has such an amazing gift and it's so great that he hasn't given up as he once contemplated!